Between this penguin and this eagle, it has been a good week for incidental animal selfies. 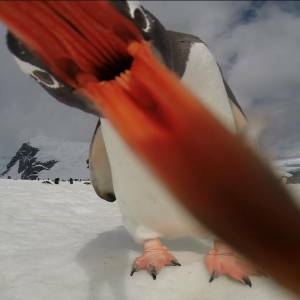 Travel company G Adventures set up a GoPro camera on a visit to Antarctica, when a penguin apparently decided to examine the equipment more closely. Yes, yes. Cute. But did you know, as I just learned, that penguins have spiny tongues for trapping wiggly fish and devouring them? That is evil, penguins, and makes this photo 80 percent more diabolical.